When the Ocoroni river in Sinaloa, Mexico, started to show signs of instability, Maccaferri Mexico were approached to propose a solution to the erosion problems. The biodegradable Biomac blanket was chosen to provide immediate protection from the elements and support the establishment of vegetation. Soil erosion is a naturally occurring process and a global environmental problem. When the Northern slope of the Ocoroni River, located in Sinaloa, Mexico, started to present signs of surface instability a solution was needed to address the hydraulic erosion problems. 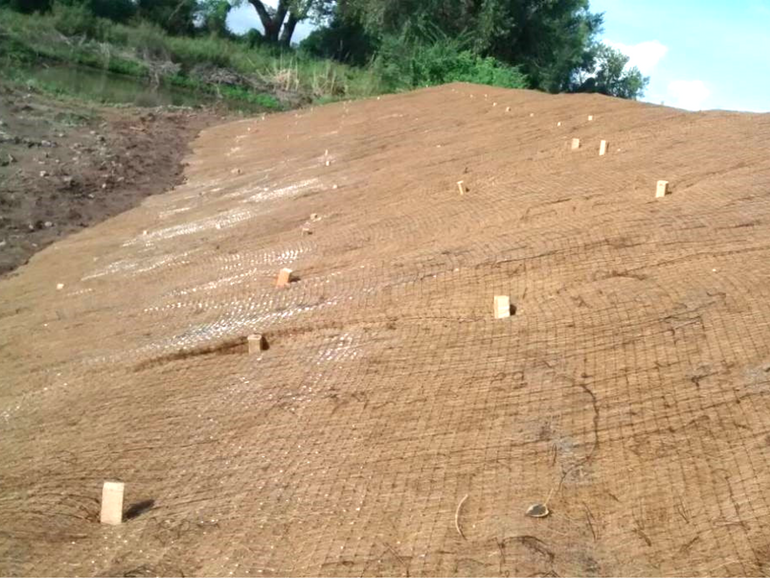 Maccaferri Mexico proposed the use of its biodegradable erosion protection blanket, Biomac. Biomac is a biodegradeable erosion protection blanket made from natural ‘coir’ fibres. When secured to the river bank it provides immediate surface protection to vulnerable slopes to the effects of erosion such as wind, rain and surface run-off. The Biomac’s three-ply composite provides a stable medium to support healthy plant growth and as the mat biodegrades over time, the protection function is maintained by the vegetation. For this project, 4600m2 of Biomac CC320 was used to protect the river bank slopes.